Ohio freshman Allie Curry runs with the ball on Friday. Ohio defeated Akron, 3-1. Photo by Carl Fonticella. Ohio defeated Akron in the MAC season opener Friday at Chessa Field, 3-1. “It (the win) puts us one step closer to achieving our goals,” Ohio coach Aaron Rodgers said. Ohio opened the scoring in the sixth minute. 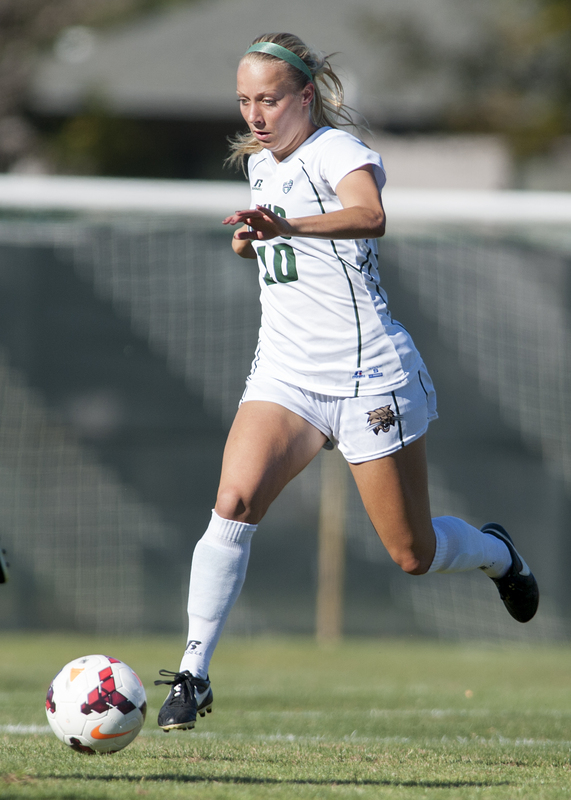 Tonya Frasik’s corner kick led to an own goal by Akron to put the Bobcats up, 1-0. Akron (4-4-1, 0-1-0 MAC) equalized in the 14th minute with a goal by forward Lani Smith. Her shot, which was assisted by Hannah Werth, bounced off the post, but Smith followed her shot to put the ball in the back of the net. “She’s a great player, and she got free and she scored a great goal,” Rodgers said of Smith. Ohio reclaimed the lead with a goal by senior Annie Beard. Frasik’s corner found Beard, who scored her second goal of the season. Ohio (4-5-0, 1-0-0 MAC) extended its lead with a goal by Allie Curry with less than a minute to go in the first half. Curry’s shot took a deflection off an Akron defender before sailing over goalkeeper Klaire Adee. Ohio will return to action on Sunday at 1 p.m. when it will face Buffalo at Chessa Field.